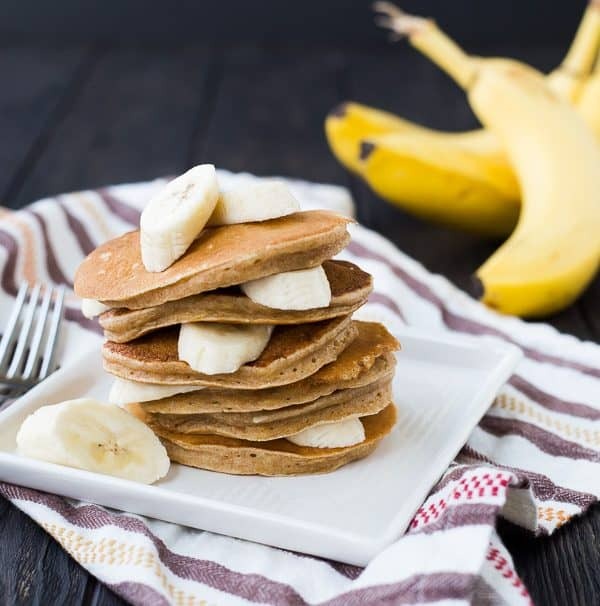 These easy and healthy banana pancakes taste just like banana bread in a whole wheat pancake form! 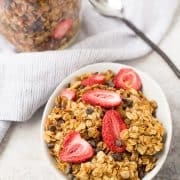 They freeze well and will make mornings delicious! Weekday mornings are hectic at my house. We live a good 20 minutes from school, so we have to get an early start in the morning to make it there on time (or to the bus, depending on the day). I get the kids up, dressed, fed, and out the door in 30 minutes flat. No exceptions, ’cause I’m not the type to be late. Seriously. N threw up in the car on the way to school today (the day I’m writing this…) and we still got E to school on time. Thank you, Ziploc bag in my purse and baby wipes. And coffee. THANK YOU COFFEE. We put clothes out the night before, and the kids are dressed with clean teeth and combed hair before we even come downstairs for breakfast. Healthy Banana pancakes get pulled outta the freezer and put into the toaster oven before I go upstairs to drag them outta bed. Backpacks and lunches ready to go the night before. Coffee ready — all ya gotta do is hit the “on” button in the morning. For me, workout clothes out and ready so I can knock that out at 5am when I’d really rather be sleeping. Protein powder is sitting next to a clean shaker cup ready to go. I have a short Rachel Cooks to-do list to knock out in the morning between working out/showering and waking them up. We’re a well-oiled machine and it works for us. I wake them up between 6:30 and 6:45 (depending on the day and the school schedule), and I refuse to make them get up any earlier than that. Or maybe I should rephrase that I refuse to make myself wake them up any earlier than that…because, UGH. Truth be told, life is all-around pretty hectic and it’s not just limited to mornings. As a high school principal, Ben works at minimum 12 hours a day. That doesn’t include evening events (at least two nights a week until 9 or sometimes later) or weekends. So, this momma has a lot to do at home between running my business, raising my kids and maintaining our household (not necessarily in that order). It works for us and we figure out ways to get most everything done. When I heard about Shipt coming to our neighborhood (we live in farm country – we don’t ever get stuff like this! ), I couldn’t have been any happier. Okay, I got even a little happier when they asked me to partner with them to try out the service and share my experience with you guys. I’ve used the service a couple times now (and actually had the same shopper working on my order both times, which was really nice!). Want the short version? VERDICT: LOVE IT. In a nutshell, you make your order online or on the app and it gets delivered to your house. We’re living the dream here in the 21st century, aren’t we? In more detail, you find your local store and start making your list. I usually start with the sale section, just like I would if I were making more list to go to the store myself. Then you can go through your meal plan or recipes and get all the ingredients you need. I made a list for these healthy banana bread pancakes so I could have all the ingredients ready to go the next morning. 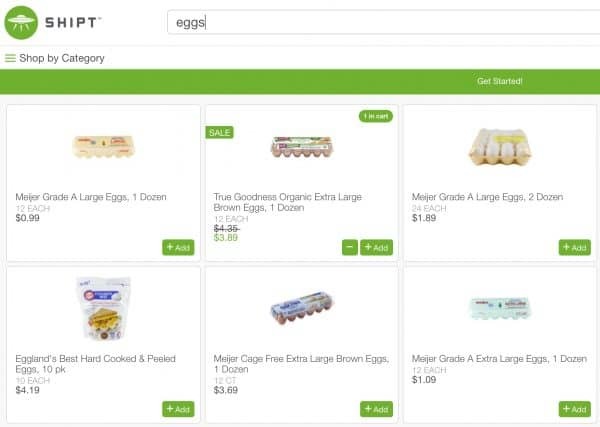 As you can see, you can type in your item (in this case eggs), and all the selections come up. You can then select the brand you like and adjust the quantity. You can you also make notes. For eggs, I might write, “Please open the package to check for any cracked eggs.” This could very well be something they are doing already because you rate your shoppers just like you would rate a driver on Uber. So, my guess is they might be checking for cracked eggs anyways so that they get a good rating….but I don’t like cracked eggs, so I’m playing it safe. 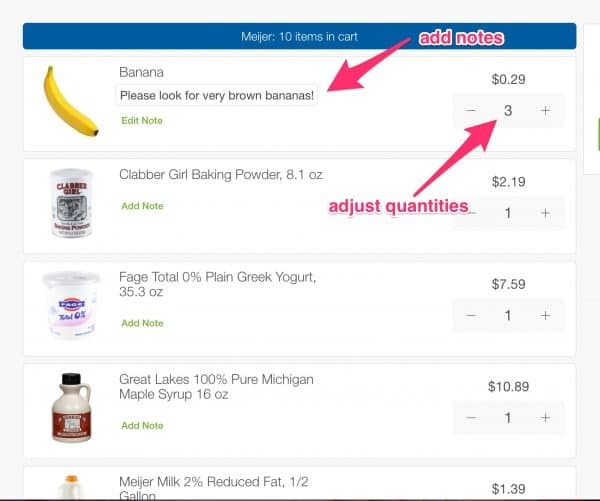 You can also adjust quantities and add notes in your cart before you place your order. You can also see that they didn’t have the kind of tomatoes I requested in my list so she asked about a substitution. The communication is great and extremely professional. Once you get your order made, you get to schedule your delivery! You guys, this makes me oddly giddy. Oh yes. 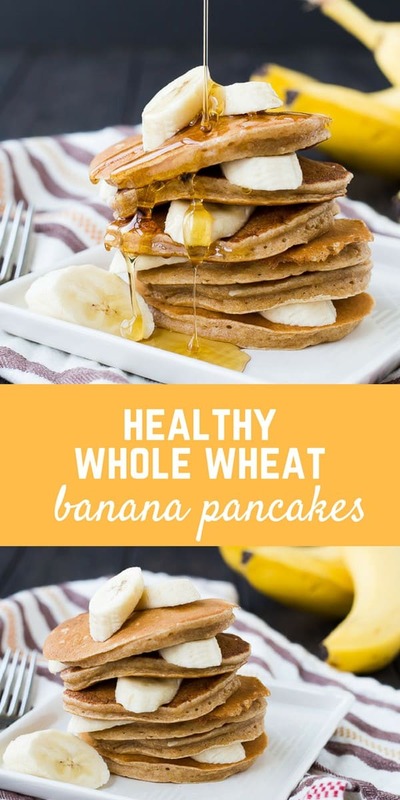 Please do delivery my healthy banana pancake ingredients tonight so I can make them in the morning. This is a game changer for recipe development too – because goodness knows I’m always forgetting something for my Saturday cooking days. 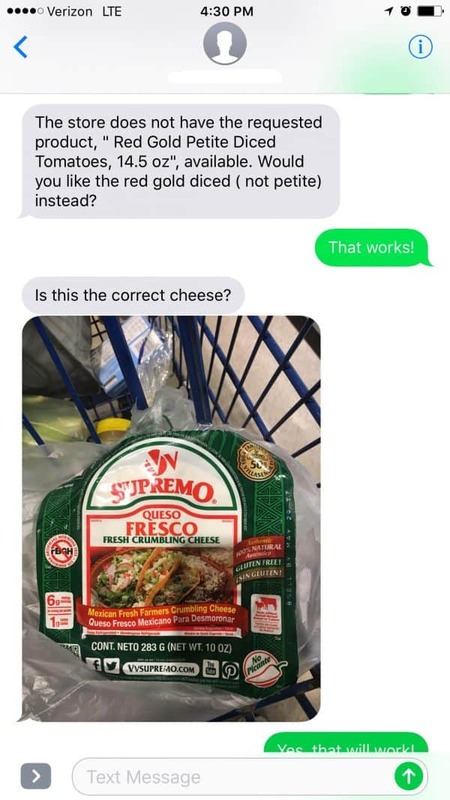 We don’t live super close to the store so having the ability to get these ingredients delivered WHILE I DO SOMETHING ELSE is making a world of difference in the level of hecticness in my house. 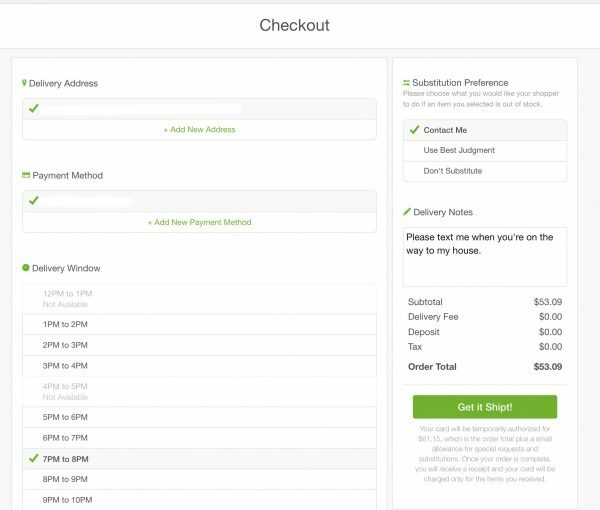 For Shipt members, delivery is free on orders over $35, and let’s be honest, it’s not hard to spend 35 bucks on groceries. An annual membership is $99 and I honestly think I’ll easily save that because I won’t be tempted by random items in the aisles as I’m wandering the store. I do also tip my shopper, because she’s great and it’s deserved…I make her thoroughly examine all the strawberries and pick out the prettiest produce, so she’s earning her tip. You can head to their website and see if it’s available in your area — for your sake, I hope it is! If you want to try it out, click here and you’ll get $10 in free groceries! 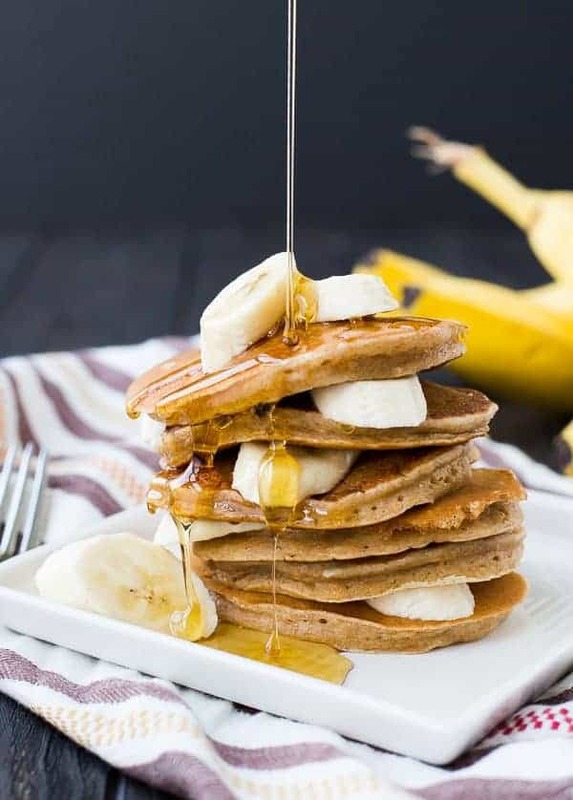 If it is, you could be looking at these healthy banana pancakes without leaving your home…and really, how great is that? They’re based off my popular healthy banana bread recipe (those photos need updating!). If you like the sounds of that recipe, I also have a chocolate banana bread recipe and a whole wheat caramel banana bread recipe that you might love. Oh and skinny banana bread muffins! The kids love those. This recipe makes fairly dense, super moist pancakes. If you like a lighter pancake, try using whole wheat pastry flour or white whole wheat flour. If you’re freezing these healthy banana pancakes, I put them on a cooling rack with parchment paper between each layer. I freeze them until frozen and then remove from rack and put them into a freezer safe bag or container. This method prevents them from sticking to each other. PS: Love pancakes? Don’t miss these buckwheat pancakes. In a large bowl, whisk together mashed bananas, milk, eggs, yogurt, coconut oil, maple syrup, and vanilla extract. On top of wet ingredients, add dry ingredients. Toss them together a bit before stirring them into the wet ingredients. Stir until combined, do not overmix. Heat a griddle over medium heat (oil lightly if your griddle needs it). Pour about 1/4 cup of pancake batter onto hot pan and cook until bubbles form and stay on surface of batter (2-3 minutes). Flip and cook until golden brown. Continue until all batter is used up. Note: This recipe makes fairly dense, super moist pancakes. If you like a lighter pancake, try using whole wheat pastry flour or white whole wheat flour. Note: If you’re freezing these pancakes, I put them on a cooling rack with parchment paper between each layer. I freeze them until frozen and then remove from rack and put them into a freezer safe bag or container. This method prevents them from sticking to each other. Verdict: I love having a bag of these in the freezer – such a quick and easy (and delicious!) breakfast. 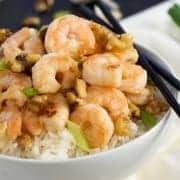 Husband’s take: He loves these! He’s a huge pancake fan in general. Changes I would make: None are necessary but if you like your pancakes on the fluffier side, see my notes. 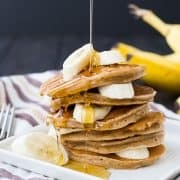 Disclosure: I’m excited to partner with Shipt to tell you about their service and bring you these healthy banana pancakes. ALL opinions are my own, I really am giddy over this service and plan to continue to pay for it out of my own pocket. 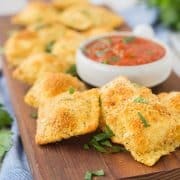 Toasted Cheese Ravioli with Pizza Sauce – with video!